Carpal tunnel syndrome is a narrowing of the carpal tunnel in the wrist causing a feeling of numbness, tingling, burning, itching, or pain in part of the wrist and hand. The affected areas include the thumb, index and middle fingers, and half of the ring finger and can be in one or both hands. Often times symptoms occur gradually over years and first begin at night. As the condition worsens, symptoms start to appear during the day and the hand may begin to lose strength (3). Manual tasks like typing, chopping vegetables, and others that require grip strength become difficult and if left untreated the hand can become almost unusable. What are the most common causes of carpal tunnel syndrome? Carpal tunnel syndrome is caused by consistent pressure on the median nerve and tendons that run through the palm side of the hand (4). 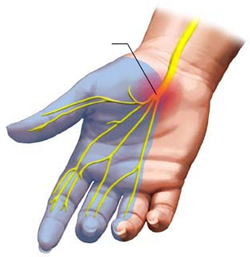 This not a problem with the nerve itself but rather with is size of the carpal tunnel – as it narrows there is not enough space for the nerves and tendons so they are compressed resulting in pain. This compression can come from repetitive motions that put strain on the tendons causing them to swell, or because some people are simply born with smaller carpal tunnels making them predisposed to carpal tunnel syndrome (5). Carpal tunnel syndrome can also be worsened by a number of other diseases including arthritis, diabetes, and obesity. When there is an underlying medical condition contributing to carpal tunnel it will usually be addressed first. Otherwise, there are non-surgical and surgical options for treatment. For mild cases, stretching, resting the hand and wrist for several weeks, and using a splint or brace to immobilize it can provide relief. Anti-inflammatory drugs can reduce pain and swelling, while corticosteroids can be injected into the wrist or taken orally to relieve pressure on the nerve. For more severe cases lasting six months or longer surgery is recommended to cut the ligament band at the wrist and relieve pressure on the nerve and tendons. How can Traditional Chinese Medicine and Acupuncture treat carpal tunnel syndrome? Traditional Chinese Medicine (TCM) and Acupuncture are used for a wide variety of pain related conditions and sports injuries. By stimulating the meridians that run through the wrist area as well as the nerves and tendons TCM can help the body decrease inflammation, lower swelling, and relieve pain in carpal tunnel syndrome sufferers. How can Acupuncture help treat carpal tunnel syndrome? Using acupuncture treatment for inflammatory conditions like carpal tunnel syndrome provides an alternate option for people who wish to avoid surgery or are intolerant to corticosteroids or anti inflammatories. Acupuncture needles can regulate the body’s immune system and exert anti-inflammatory effects (6). In a 2009 study, 38 carpal tunnel syndrome patients were administered eight acupuncture sessions over four weeks (while 39 underwent a daily oral steroid treatment). The results showed that “short-term acupuncture treatment is as effective as short-term low-dose prednisolone for mild-to-moderate carpal tunnel syndrome” (7). The study also found that the acupuncture patients had fewer instances of waking up at night due to pain and better nerve conduction than the steroid group. A more recent study in 2012 compared patients who were administered acupuncture plus night splinting with a control group using night splinting, vitamin B1, B6 and sham acupuncture for four weeks. The results found that acupuncture can improve the overall subjective symptoms in carpal tunnel sufferers (8) and would be a good addition to any comprehensive treatment program. What can I expect during an Acupuncture treatment for carpal tunnel syndrome? An acupuncture session would include the use of points both close to the painful area on the wrist(s) and distal points elsewhere on the body. For mild to moderate cases, four weeks with two sessions each week is recommended for the best results with a progress assessment at the end of this period. More severe cases may require a longer treatment period. In either case, regular maintenance sessions are also recommended to prevent the return of significant symptoms. If you or a loved one are experiencing carpal tunnel symptoms, please do not hesitate to contact us to find out if/how Acupuncture and Traditional Chinese Medicine can benefit you, and help you get back to enjoying your daily activities.